Following conclusion of the independent examination, the Council has published the Sutton Neighbourhood Plan (referendum version), Examiner's Report and Decision Statement. The plan meets the basic conditions and willl proceed to referendum in May 2019. For more information, please visit the Sutton Neighbourhood Plan page. Following submission of a Neighbourhood Area application by Isleham Parish Council, East Cambridgeshire District Council has designated Isleham parish as a Neighbourhood Area for the puposes of neighbourhood planning. A map showing the boundary of the Isleham Neighbourhood Area is available to download at the bottom of this page. 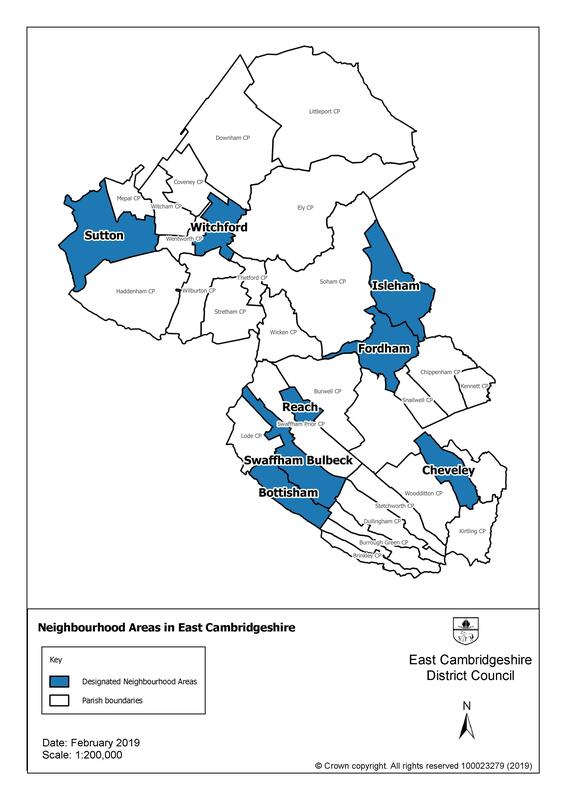 Following submission of a Neighbourhood Area application by Reach Parish Council, East Cambridgeshire District Council has designated Reach parish as a Neighbourhood Area for the puposes of neighbourhood planning. A map showing the boundary of the Reach Neighbourhood Area is available to download at the bottom of this page. In November 2018, Witchford Parish Council submitted an application to amend its existing Neighbourhood Area. The change is necessary to align the Neighbourhood Area with the new parish boundary, which will be amended following a Community Governance Review. A map of the Neighbourhood Area is available to download from the table at the bottom of this page. Following submission of a Neighbourhood Area application by Swaffham Bulbeck Parish Council, East Cambridgeshire District Council has designated Swaffham Bulbeck parish as a Neighbourhood Area for the puposes of neighbourhood planning. A map showing the boundary of the Swaffham Bulbeck Neighbourhood Area is available to download at the bottom of this page. Following submission of a Neighbourhood Area application by Cheveley Parish Council, East Cambridgeshire District Council has designated Cheveley parish as a Neighbourhood Area for the puposes of neighbourhood planning. A map showing the boundary of the Cheveley Neighbourhood Area is available to download at the bottom of this page. Sutton Parish Council has submitted its Neighbourhood Plan for independent examination. To view the Plan, please visit the Sutton Neighbourhood Plan page. Paper copies are available for inspection at the Council's Customer Service Centre during normal opening times. The Council has appointed an independent examiner to conduct the examination. The examiner will determine whether the plan meets the basic conditions and other legal requirements. If successful at examination, a referendum will be held allowing local people to vote on whether the plan should be used by the Council in determining planning applications. On 08 November 2018, the Council held a referendum on whether the Fordham Neighbourhood Plan should be used in deciding planning applications in Fordham. The neighbourhood Plan was supported by the majority of voters, with 87% of votes in favour of the plan. The Fordham Neighbourhood Plan was formally 'made' by East Cambridgeshire District Council on 18 December 2018 and is used by the Council in taking planning decisions. 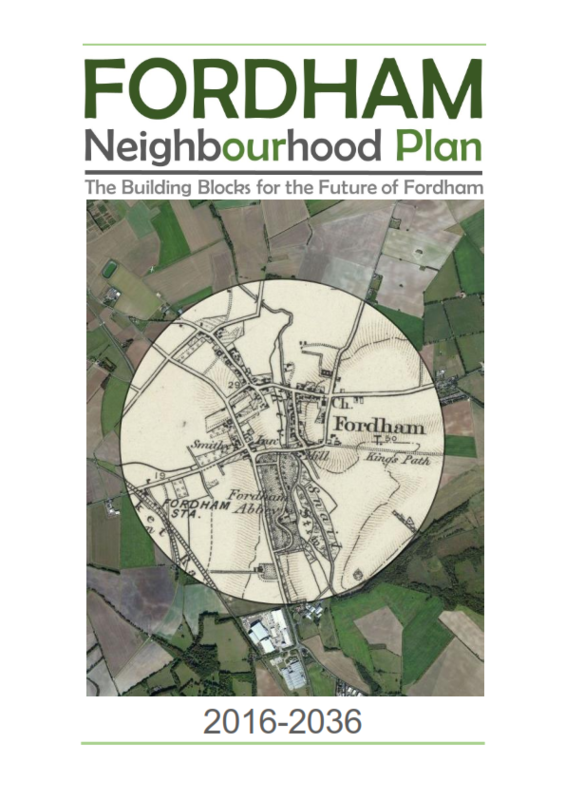 The Fordham Neighbourhood Plan and supporting documents are available to download from the Fordham Neighbourhood Plan page. A paper copy of the Fordham Neighbourhood Plan is available for inspection at East Cambridgeshire District Council's Customer Service Centre at The Grange, Nutholt Lane, Ely, Cambridgeshire CB7 4EE. Neighbourhood Plans, NDOs and CRtBOs can be used to add more detail to the policies in the Council’s plans, or cover other aspects appropriate to the aspirations of the community living in the area. Once ‘made’ by the Council, the Neighbourhood Plan, NDO or CRtBO will form part of the Development Plan for East Cambridgeshire and will be used in determining planning applications in the area. The Fordham Neighbourhood Plan became part of the district's Development Plan, following referendum on 08 November 2018. The table provides a summary of each neighbourhood planning project in the district. For further information, please contact the relevant parish or town council. Sutton Parish Council 08 January 2015 Sutton Neighbourhood Area Map The Sutton Neighbourhood Plan was examined in Feb-March 2019 and will proceed to referendum. See the Sutton Neighbourhood Plan examination page for info.